A cigarette/cigar lighter made by S. T. Dupont. QUESTION: My grandfather received a gift of a cigarette/cigar lighter made by S. T. Dupont. It still is in its period box and has never been used. The bottom of the lighter is marked “S. T. Dupont / PARIS / MADE IN FRANCE / 20u / 198048.” The “gold” lighter case features alternating horizontal lines of dots and vertical dashes. The blank end of the flip top is not engraved. Any help you can provide would be great. – LB, State College, PA, Email Question. ANSWER: Simon Tissot-Dupont, who had served as a photographer for Napoleon III, founded S. T. Dupont in the second half of the nineteenth century. Initially, S. T. Dupont made travel bags and cases for wealthy aristocrats, businessmen, diplomats, and royalty. The company became a supplier to Les Grands Magazins du Louvre in 1884. Following World War I, Simon’s son assumed management of S. T. Dupont. He expanded the company and hired skilled artisans, craftsmen, and designers. The Cartier Boutique on Fifth Avenue, New York, was the primary American outlet for S. T. Dupont bags and cases. At the request of the Maharajah of Patiala, S. T. Dupont began manufacturing lighters in the late 1940s. Building upon the fame of its solid gold lighters, S. T. Dupont soon became a leading manufacturer of cigar accessories. In the 1950s and 1960s, S. T. Dupont used celebrity licensing to promote a line of pens. S. T. Dupont continues to manufacture luxury accessories. Click here for more information. Since your lighter does not contain a karat mark, I am assuming it is gold plated. 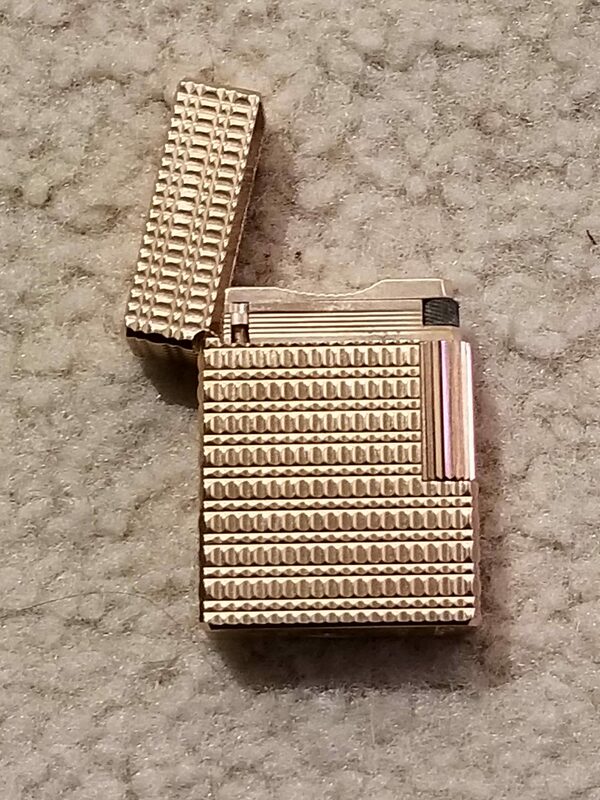 The retail price for modern S. T. Dupont gold plated lighters starts at $200.00 and goes up from there. Limited edition, karat gold lighters command in the low thousands with some vintage examples exceeding $8,000.00. WorthPoint.com has almost 3,000 listings for S. T. Dupont lighters. I reviewed most of them. Although I did not find an exact match for your lighter, I found numerous comparable examples. A fair retail secondary market value for your S. T. Dupont lighter is between $125.00 and $150.00. Finding the “right” buyer may result in a slightly higher return. 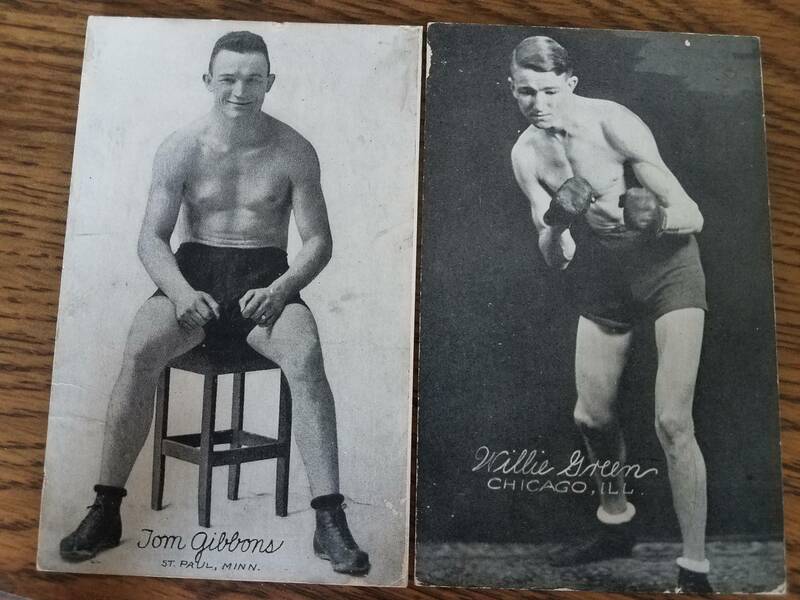 Boxing cards from the 1920s. ANSWER: When doing appraisal clinics, I sometimes jokingly say: “The key to being a good appraiser is to take time to look at the wording and marks on an object.” In the case of your boxing cards, the back of the Jack Dempsey card is marked “Copyright 1923 by Ex. Supply Co.” and the back of the Tommy Gibbons card is marked “Copyright 1921 by Ex. Supply Co., Chgo.” Based on this information, you boxing postcards date from the early 1920s. The Exhibit Supply Company of Chicago is well known to arcade card collectors. George Vrechek’s “A look back helps understand Exhibit Supply cards” in the September 25, 2017 issue of “Sports Collectors Digest” provides a detailed history of the company. The Exhibit Supply Company (ESCO) was founded in 1901. In 1907, J. (John) Frank Meyer, owner of Meyer Printing Company, gained control of ESCO. Within a short period of time, the Exhibit Supply Company, which supplied cards that initially sold for 1/2 cent each for use in arcade vending machines, had over 275 employees. In addition to printing the cards, ESCO developed arcade machines to dispense them. ESCOs earliest arcade cards were “art models.” In the 1920s, a new series of cards featuring baseball players, boxers, movie stars, and additional art models were issued every 30 days. While baseball players, boxers, and movie star cards sold in penny arcade machines, art model cards were found in nickel machines. Some early arcade cards had postcard backs. Many arcade cards were pasted into scrapbooks. When removed incorrectly, a portion of the information on the back is destroyed, either remaining along with the paste on the scrapbook page or by large chunks of paste still attached to the card’s corners. When this occurs, as in the case of your cards, the value is impacted negatively. In order to create demand, ESCO often changed out the poses of sports stars. Over half a dozen Jack Dempsey images were used. WorthPoint.com has a listing for the 1923 Jack Dempsey ESCO arcade card that sold on eBay on May 26, 2018, for $19.95. The back was not damaged. Given the condition of your cards, a realistic secondary market price is around $5.00 each. If you plan to sell them, I suggest selling them as a set. Ask $50.00, a “set” value as opposed to a single card value. ANSWER: The memories of Don Warning’s Memories of Santa figurines are fading. Secondary market prices for these figurines continue to decline and are likely to do so into the future. According to information found here, Don Warning used the inspiration from chocolate molds, early chromolithographs, and early 20th century postcards to create his line of Memories of Santa figurines. 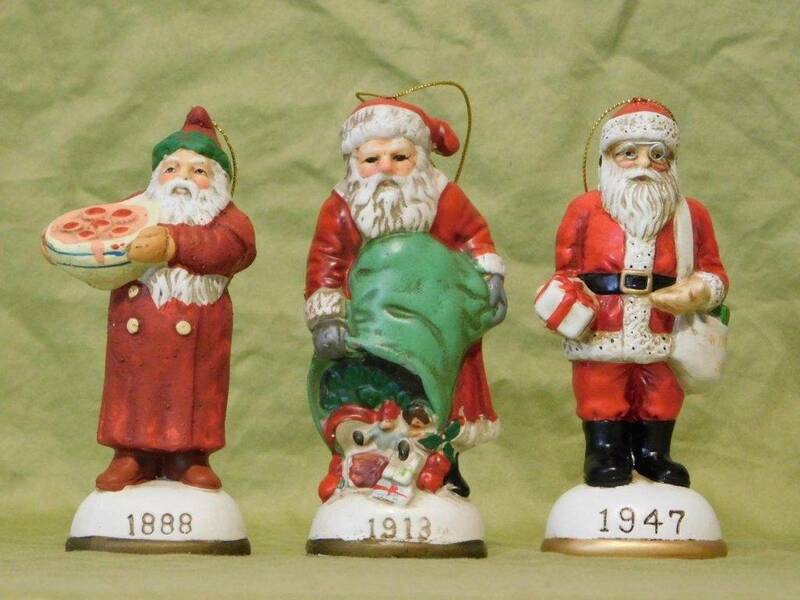 The figurines trace the evolution of St. Nicholas into today’s Santa Claus. This set of 3 Don Warning Santas sold for $10.99 in January 2019. The Memories of Santa collection, first introduced in 1983, included 139 earthenware, hand-painted Santas. Some were copied by other companies or changed slightly. The collection series ended in 2003. The line was supplemented by books, collector plates, posters, trading cards, and other memorabilia. Although the memory of the Memories of Santa Collection is fading, the subject matter still attracts some collectors. Your book represents a checklist for figures made between 1983 and 1992. When the book appears on eBay, it sells through if priced for less than $10.00. Figurines, even with period boxes, now sell in the $4.00 to $6.00 range. Dealer asking prices are higher, based on the image appeal as opposed to the collection association. QUESTION: I have a collection of World War II “Life” magazines that I inherited from my great uncle. There are a lot of them, some slightly damaged by an itinerant raccoon that found its way into the attic. The January 1945 issue features Patton on the cover. My late step-father-in-law served with Patton in Sicily and the invasion of the Continent. I still have his uniform with the bronze star Patton pinned to it. What should I do with the collection? – GN, OH, Email Question. ANSWER: Putting aside the issue of damage, the first thing you need to do is put the magazines in chronological order. The goal is to determine if you have a run of six months or longer. In the past, these magazines sold because (1) the image on the cover, (2) the advertising inside [ripped out and sold as magazine tear sheets], or (3) a birthday week gift [gifting a family member, relative, or friend with a magazine issued the week they were born]. Time is the enemy of all three. Interest in the individuals who appeared on the covers or cover themes has faded. Covers that once sold for over $25.00, now command $10.00 or less. Using framed magazine tear sheets as a home decorating décor is long past its prime. Again, many of the images and subjects are no longer remembered by the current generations. Finally, individuals born during the time period are rapidly decreasing in number. I have no interest in obtaining a copy of a magazine issued during the week of September 28 and October 4, 1941, my birth week. 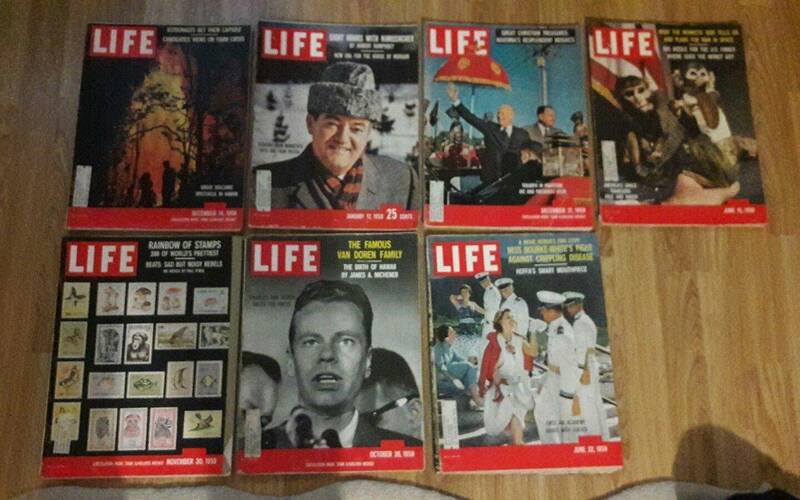 This set of 1959 Life Magazines sold for $15 in May 2018. If someone offered you fifty cents a magazine for the lot, my advice is to take it. You can checkout out each issue on eBay to see what the asking price is. If you have access to an eBay seller, my recommendation is to list your examples at half the current asking prices. If your collection is typical, the majority of the value will rest with 10 percent or less of the magazines. You may wish to sell these and donate the balance to a charitable white elephant sale.